We are a leading OEM Manufacturer of box strapping machine from Rajkot, India. • High adjustable strap tension of over 90 kgs. 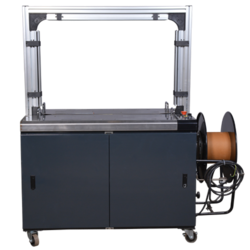 • Easy loading or unloading of strapping roll as dispenser is placed outside.